Some of hip-hops most influential bangers of the last four years have started with the infamous beat-tag “We got London on da Track” the trademark of the super producer out of Atlanta. The producers beat catalog ranges from legacy acts such as Gucci Mane, Lil Wayne, and Jeezy to artists that he helped mold such as Young Thug, Rich Homie Quan, and so many more. London has become a pioneer of the Atlanta trap-influenced sound that has been taken from a regional style to a international hip-hop sensation. Now that London has proven that he can facilitate hits for others, he is taking matters into his own hands and releasing a solo project under RCA Records titled “Who Would’ve Known” set for release soon. 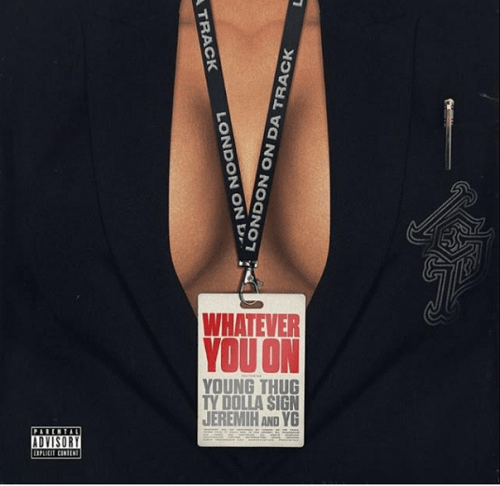 The first single “No Flag” with Nicki Minaj, 21 Savage, and Offset has lived up to the star-studded hype and now with “Whatever You On” as the second single it seems like London can’t miss. The track features Ty Dolla $ign, Jeremih, YG, and Young Thug in a sequence of different melodies and flows from the superstar collaboration. The single is also packaged with a video that tackles a concept of an office party theme where the artists show that they can turn a boring environment into a good time. It is clear that London on da Track is exploring music from more of a pop-angle and as his genre of music is at the forefront he is capitalizing on the moment. It should be interesting to see how “Who Would’ve Known” performs in this musical climate because London has the formula to succeed in it.